Trainer Peter Miller's highly accomplished Stormy Liberal heads a field of nine 3-year-olds and up in Friday's Grade III, $100,000 Eddie D Stakes, to be run at about 6 ½ furlongs down Santa Anita's unique hillside turf course. Named for legendary retired Hall of Fame jockey Eddie Delahoussaye, the Eddie D will highlight a nine-race program on opening day of Santa Anita's 22-day Autumn Meet. Fresh off a pair of five furlong turf sprint wins at Del Mar, Stormy Liberal adores the hillside layout here, evidenced by the fact he has seven wins and four seconds from 13 tries over it. 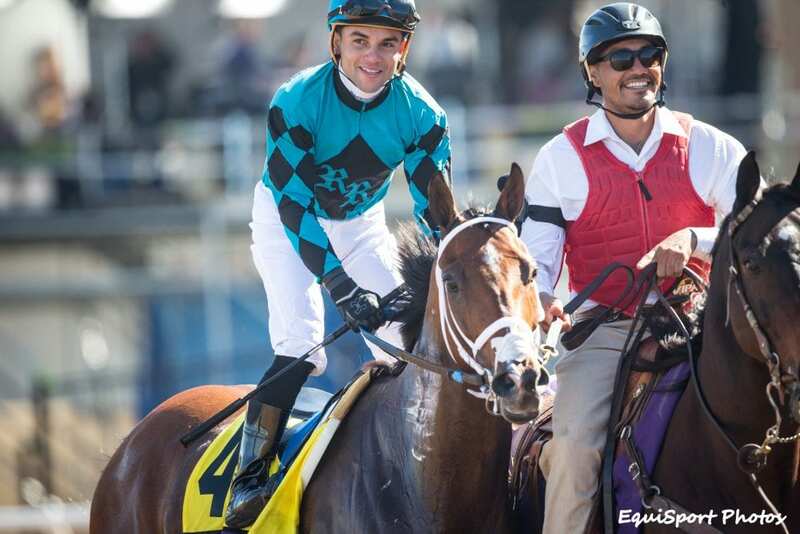 A winner of last year's Grade I Breeders' Cup Turf Sprint at Del Mar, Stormy Liberal, a 6-year-old Stormy Atlantic gelding, will use the Eddie D as a prep to this year's Breeders' Cup Turf Sprint, to be run Nov. 3 at Churchill Downs. With two wins and as many seconds from five starts this year, Stormy Liberal, a 6-year-old Stormy Atlantic gelding who is out of the Royal Academy mare Vassar, appears to be at the top of his game as he rounds third toward a defense of his BC Turf Sprint title in November. Ridden to victory in last year's Breeders' Cup by eastern-based Joel Rosario, he was guided to a pair of nose victories on July 25 and Aug. 17 by up and coming Drayden Van Dyke. With Miller calling the well-executed shots, Stormy Liberal, who has seven wins from 13 races over the course and who sports an overall mark of 28-10-8-1, good for earnings of $1,308,930, looms the horse to beat on Friday. Also trained by Miller, Conquest Tsunami is yet another 6-year-old gelded son of Stormy Atlantic. Nothing short of brilliant in two hillside starts earlier this year, he took the Grade II Daytona Stakes in dazzling gate to wire fashion four starts back on Feb. 24, winning by 2 ½ lengths and will likely employ similar tactics Friday when he tries to notch his third win from five hillside tries. A disappointing 12th and last as the 5-2 favorite in the one mile turf Wickerr Stakes July 22, he'll get the first-time services of top jock Flavien Prat in the Eddie D.
Although winless over the course, this 4-year-old colt by The Factor has three seconds from as many tries down the hill and appears a very “live” commodity with Tyler Baze back aboard on Friday. Attentive to the early pace, he tired to finish fifth, beaten three lengths, going 1 1/16 miles on turf in a third condition allowance Aug. 16 at Del Mar. A sharp second in a minor hillside stakes here three starts back on June 22, Cistron is well spotted for a solid effort in the Eddie D.
Third, beaten 1 ¼ lengths by Stormy Liberal in the five furlong turf Green Flash Handicap Aug. 17, Touching Rainbows will be ridden back by Gary Stevens, who also guided him to a solid third place finish in the Grade I Bing Crosby Stakes at six furlongs on dirt July 28. A 5-year-old gelding by Aragorn out of the Gold Case mare Violin Case, Touching Rainbows rallied from off the pace in the Green Flash, but with a clean break, he'll likely try to press the likes of Conquest Tsunami in the early stages on Friday. First post time for a nine-race program on Friday will be at 1 p.m. Friday will also mark the debut of the Stronach 5, a one dollar minimum wager with an industry-low takeout of 12 percent. This Friday's Stronach 5 will have a guaranteed pool of $50,000 and will emanate from Laurel Park, Md., beginning at approximately 2:26 p.m. PT. This entry was posted in Racing and tagged conquest tsunami, david bernsen, Eddie D. Stakes, eddie delahoussaye, Peter Miller, rockingham ranch, santa anita, santa anita park, Stormy Atlantic, stormy liberal by Mike Willman/Santa Anita. Bookmark the permalink.